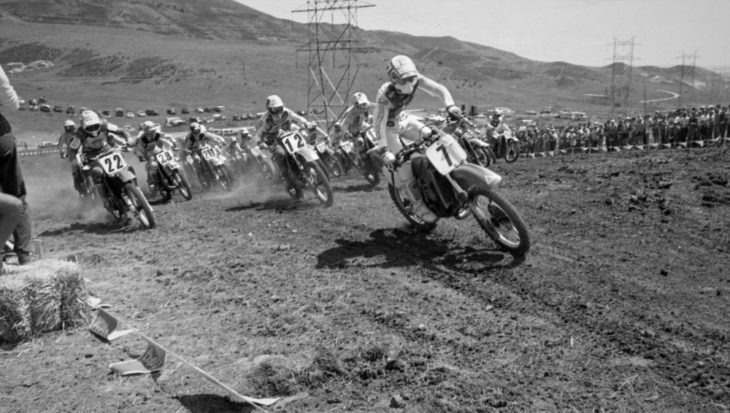 In this week’s Throwback we travel back 34 years to August of 1984 and the AMA Motocross National in Lakewood, Colorado. The track was then called Lakewood Motorsports Park and today is known as Thunder Valley Park in the western Denver suburb of Lakewood. The event that year was the penultimate round of the outdoor nationals. Honda’s Ron Lechien was in a heated battle with Yamaha’s Rick Johnson for the 250 national title. Lechien did everything he could that day, going 1-1 to win the Lakewood 250 National. The victory moved Lechien to within just three points of Johnson going into the final round at Washougal, Washington, basically setting up a winner take all finale. In this photo you can see Lechien (No. 7) getting a great start at the beginning of the first moto. Giving chase are Jeff Hicks (No. 22), Billy Liles (No. 12), Rick Johnson (partially hidden behind Lechien), Jim Holley (No. 28) and others. Of course, Johnson went on to win the season finale in Washougal. clinching the AMA 250 MX National Championship over Lechien by just 8 points.